The next Inventions of the Text seminar will take place on 27th May at 17.30. 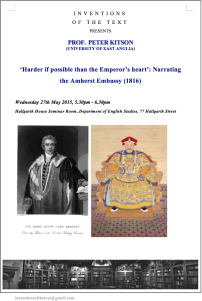 Professor Peter Kitson (University of East Anglia) will talk on “Narrating the Amherst Embassy (1816).” Attendees from outside Durham are welcome, but please email inventionsofthetext@gmail.com to reserve a place. This entry was posted on Monday, May 18th, 2015 at 4:09 pm	and posted in Writing. You can follow any responses to this entry through the RSS 2.0 feed.